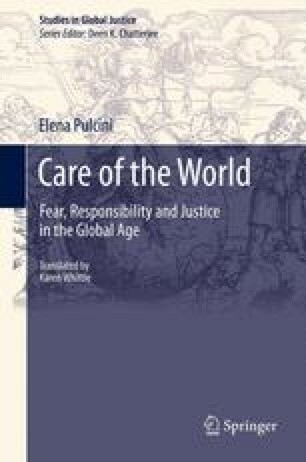 This chapter develops the topic of responsibility and underlines its complexity. Starting from the reflection of Anders, Jonas and Lévinas, the concept of responsibility is not taken in the (juridical) acceptation of answering for (something) but in the (ethical) sense of responding to (someone); and the concept of responsibility for proposed. In the three authors, the nexus between vulnerability and responsibility is seen in different ways. Jonas stresses the other’s vulnerability (of the world, future generations) and the duty to respond to his call; Anders starts from the subject’s vulnerability and the nostalgia for the limit and vulnerability as a motivation for responsibility; while Lévinas allows us to unite the two moments, proposing what we can define as the subject’s vulnerability to the other. Thinking of responsibility as responsibility for requires us to think of a relational subject, who originates from the awareness of vulnerability and transforms the latter, as Judith Butler says, into an ethical resource. However, the chapter stresses the necessity of this awareness and the strategies to access it, underlining the fact that the global age produces a series of symbolically significant events (such as September 11 or the ecological catastrophes) capable of emotionally reawakening the perception of the human’s fragility. Lastly, it is proposed to integrate the concept of responsibility, which risks being restricted to a pure and abstract ethical principle, with the notion of care, in the acceptation reproposed by feminist thought (starting from Gilligan). This is not just because care presupposes the idea of a relational subject, but also because, as its dual etymology of concern and solicitude shows, it implies a practical aspect of active and widespread commitment which instead does not pertain to the concept of responsibility.